With the official start of spring weeks away, a winter storm dumped more than a foot of snow on parts of the northeastern U.S.
BOSTON (AP) — With the official start of spring weeks away, a winter storm dumped more than a foot of snow on parts of the northeastern U.S. overnight Monday, prompting school closures, power outages and a messy morning commute. Temperatures were then expected to plunge into the teens overnight and linger there for the most of the week, raising the risk of dangerously icy conditions, officials and meteorologists warned. But, at least in New England, the snowy weather isn’t completely done: more could be on the way Friday or Saturday. That storm is still too early to predict, but it shouldn’t be as significant, said Bryce Williams, a Boston-area meteorologist for the National Weather Service. Monday’s storm, which started Sunday night but hit the hardest in the early morning hours, was the largest storm parts of New England have seen in a relatively quiet winter. 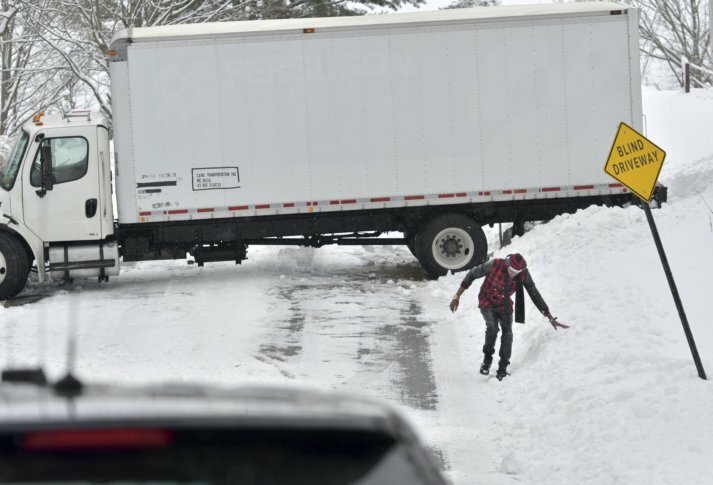 Boston saw about 10 inches of snow, but parts of Connecticut, Rhode Island and Massachusetts saw up to 16 inches (41 centimeters), according to the National Weather Service. The Boston-area has now registered about 26 inches (66 centimeters) of snowfall this season, still below the region’s average of over 35 inches (90 centimeters). New Englanders have grown accustomed in recent years to seeing winter start slowly and linger past its welcome. Meanwhile, just 5 inches (13 centimeters) of slushy snow fell in New York City and quickly began to melt Monday. The modest totals were still enough for Democratic Mayor Bill de Blasio to close schools, as did hundreds of other communities throughout the country impacted by the storm. In parts of Nebraska, dangerously cold temperatures prompted closures as wind chill temperatures registered as low as 40 below zero (minus 40 Celsius) Monday morning. In the Philadelphia-area, the storm appears to have contributed to the death of two teens in a single-car accident about 30 miles (48 kilometers) Sunday evening. The driver, a 17-year-old, was hospitalized. And in New England, nearly 60,000 customers were without power at the storm’s peak, though many of those had their power restored by the afternoon. In the Boston suburb of Needham, a snowplow struck a gas meter at an assisted living complex, triggering a gas leak and forcing more than 100 elderly residents to evacuate. No injuries were reported and residents were able to return after a few hours. In northern Maine, a small regional jet carrying 28 passengers and three crew members slid off a runway at Presque Island International Airport. The pilot and three passengers suffered minor injuries, and part of the plane’s landing gear appeared to have been torn away as it came to rest in deep snow Monday morning.